Welding is a permanent joint which is used to join various metal and thermoplastic components. Welding process includes reaction of oxides and generation of flux which further melts the welding consumables such as stick electrodes in order to develop a permanent join between the components and parts. Rapid growth in automobile industry, technological advancements in marine and power generation sectors, rising demand for efficient welding consumables owing to increasing infrastructure in industrial processes are some of the key factors expected to pave the market growth for the welding consumables market in near future. The welding consumables market of Asia-Pacific is estimated to dominate the market with 33.5% share of revenue by the end of 2016. Moreover, the market accounted the largest revenue share of 31.5% in 2015 in overall welding consumables market across the globe. On the other hand, Latin-America welding consumables market is expected to be the fastest growing market over the forecast period across the globe due to rapid growth in automobile industries and rising adoption of advanced welding techniques in the region. Wide-scale applications of welding consumables in various industries such as automotive, construction and building infrastructure, oil and gas industries are swelling the demand for welding consumables across the globe. Further, introduction of various advanced welding techniques and rise in adoption of these techniques by various end-use industries to offer the products with high-strength and load-bearing capacity. Emergence of industrial automation and automobile industries, huge investment in automotive sector and rising concern towards quality product, thus increase the demand for welding consumables in this sector. Rapid growth in industrial automation and automobile industries, increasing building infrastructure in emerging economies, rise in use of metal, thermoplasts, alloy equipment and assemblies in order to provide better strength to the structures and are some of the major key factors further anticipated to trigger the demand for welding consumables in near future. In addition to this, factors such as introduction of advanced welding techniques, technological advancements in construction and automobile sector, going-on researches to provide efficient welding consumables, rising demand of stick electrode owing to its wide scale application are expected to fuel the demand for welding consumables market over the forecast period i.e. 2016-2023. Moreover, presence of eminent elements in welding consumables such as nickel, aluminum, copper, etc. ; to provide high strength and increasing load bearing capacity of the joints is one of the vital factors growing the demand for welding consumables in various industries. 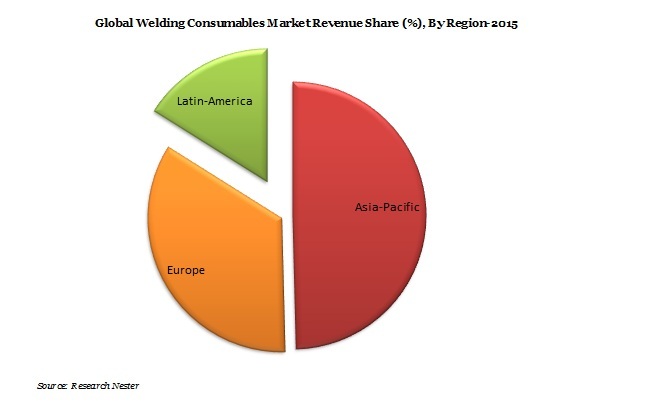 However, lack of skilled labor in production sector, slow adoption of advanced welding techniques in developing nations across the globe are some of the factors hindering the growth of welding consumables market globally.